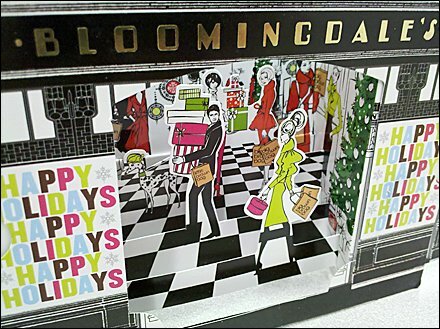 Though this amazing Bloomingdales popup 3D Gift Card was on duty during the Holidays, I only now retrieved it from a thumbdrive for comment. So my post is late, not Bloomingdales excellent marketing. SEARCH “Gift Card” for fixtures that display niceties like this. And though not actually “Window Dressing,” this item groups well with the posts in that and the “Diorama” keyword SEARCH. Follow those paths to see what you find.